2018: Demand Going Up or Down? Why Should You Opt for Blockchain Jobs? That graph above has been taken from google trends. 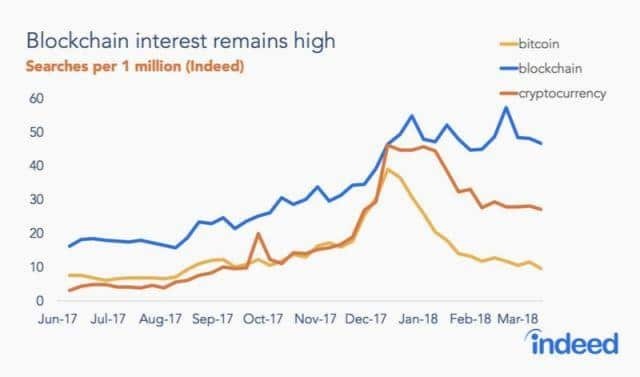 What it shows is the amount of interest that people have shown towards the keyword “Blockchain Jobs” over the past 5 years. As can be seen, the need and the general interest in this subject has been increasing, and rightfully so. Since this happens to be such a hot topic, this guide will address some of these issues. If you are looking for a blockchain job, or if you have a blockchain company and are looking to hire someone, this guide is for you! 2017 was the seminal year for blockchain technology. You could even say that that was the year when blockchain technology truly arrived. The numbers don’t lie and some of the numbers are truly staggering. Indeed.com, one of the biggest job portals in the world, published some interesting statistics regarding the rise of Blockchain jobs. It looks like the number of blockchain jobs increased from December 2016 to December 2017 by a staggering 207%. But that’s not the end of it. According to the stats, this number has increased by, a scarcely believable 631% since November 2015. Cryptocurrency was such a hot topic in 2017, that 15 of the 18 more popular industry jobs specifically mentioned “cryptocurrency” in the description. Showing how hot cryptocurrency has become in 2017 after being generally overshadowed by blockchain in 2016, 15 out of the 18 most popular industry jobs specifically mentioned “cryptocurrency” in the description. 2018 saw the overall market cap for bitcoin and other cryptocurrencies go down. It seems that the demand for cryptocurrency jobs is directly related to the market cap as well since those seemed to have gone down as well, according to this article by Quartz. Since this is such a young field and the talent available is pretty limited, the salaries offered throughout both technical and non-technical fields are 10-20% higher than the salaries offered in a normal job. Plus, it is also worth noting that the profit sharing models in crypto jobs are way better and the incentives a lot higher. Remote jobs are on the rise and more and more people are quickly shunning the concept of an “office” and opting for location flexibility. This is another area where crypto companies outdo their legacy peers. Plus, remember that crypto companies are far more likely to give you the “work from home” option and require you to come to work only on specific days. This is a perk which is limited to token companies. Usually, at a startup, employees receive equity and have to wait for a liquidity event to sell shares and get Fiat currency. This may itself be a very complex process and in many scenarios, grants given by companies are very restrictive which blocks secondary transactions. In blockchain companies, employees usually get tokens which acts as an equity-like compensation. These tokens, unlike shares, are inherently liquid, even though some of them may still have restrictions on them. So, now that you know why you should look for a career in the blockchain space, let’s see exactly what you can do. 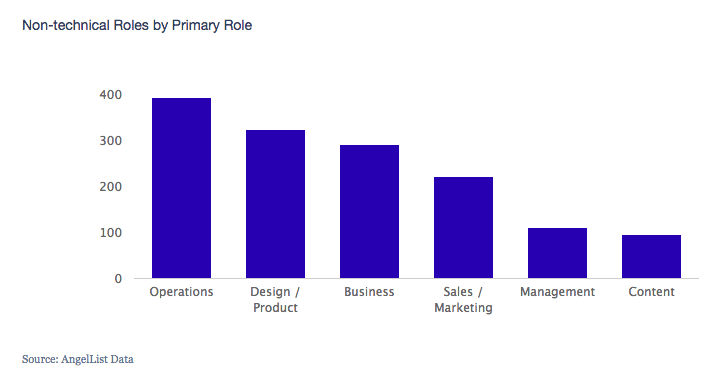 The following chart shows the breakdown of the jobs in this space. Now keep in mind that the chart shows the requirement specified in Angel list, but we feel that it gives a fair breakdown of the requirement in general. Note: Developers are included in Engineering. Blockchain Developers are easily the most in-demand niche in the space. They are the ones who get paid the highest and depending on where they are working, they may get staggering levels of salary. 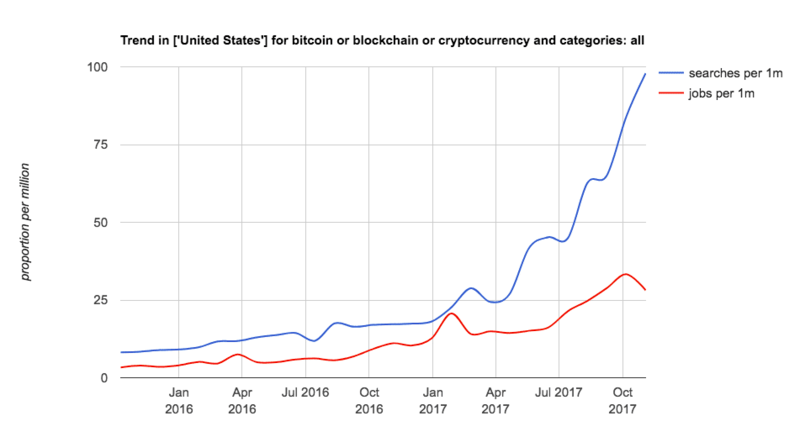 E.g.in Silicon Valley, US, a blockchain developer can get an annual wage of $158k. When you compare that with the fact that a senior hardware developer in NVidia gets an annual salary of $135k, it is pretty impressive. However, that’s not the end of it. 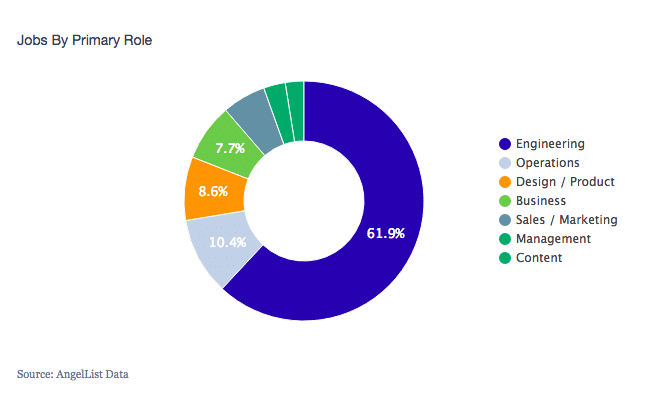 In Switzerland, blockchain developers get paid 120k-180k USD annually but in a stark contrast, developers in Great Britain get paid 50-90k annually. But that’s for salaried folks. What about freelance developers? According to this article by Kirill Shilov, freelance consultants can get paid from $50 – $100 per hour. So, what do you have to do to become a blockchain developer? 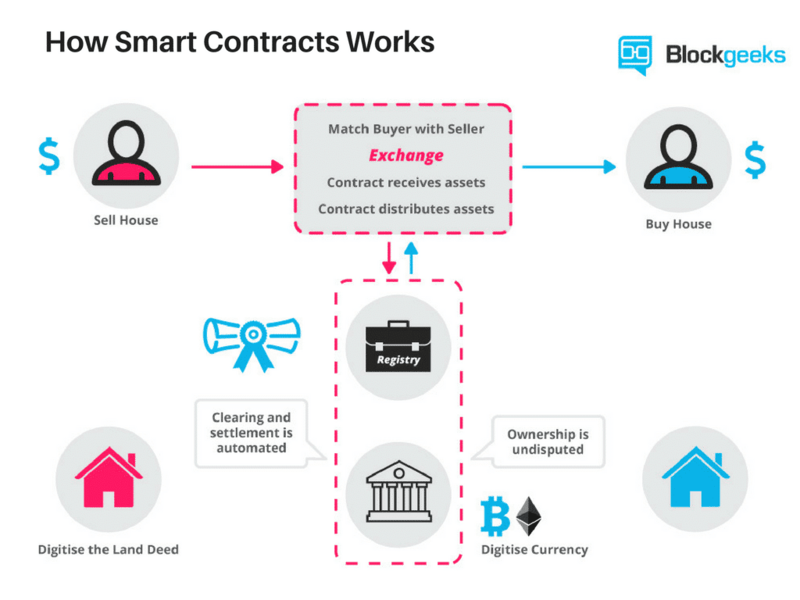 First, of, you need to know what smart contracts are, and since Ethereum is the hottest smart contract platform out there, you must learn how to code in solidity. So, before we continue, let’s check out a basic Solidity contract example. (Codes taken from github). Inside the getSum() function we are going to add up the contents of the array itself. The way is going to do it is by repeating the same while loop as above and using the variable “sum” to add the contents of the array. The main thing with this space is that it is constantly evolving. If you want to get into this space, then you will need to be constantly evolving. Since they are getting into the blockchain space, they must have the basic knowledge of blockchain technology. People involved in business and marketing must have enough knowledge to troubleshoot problems and speak confidently about the technology. If you are involved in any form of customer support, then you need to know how the technology works. Now let’s look at some of the big legacy companies that are offering blockchain jobs. Most of the data has been taken from Glassdoor. 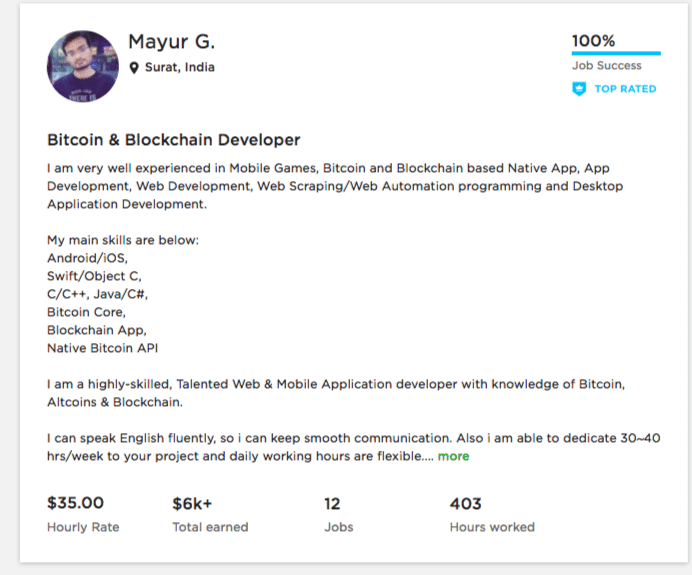 You can also browse blockchain jobs at Bountyone.io. Let’s look at some of the blockchain posts available in IBM. IBM Global Business Services (GBS) is hiring strong Senior Consultant Developers who develop technical solutions to solve clients’ problems in various industries on one or more of the Blockchain Technology platforms, such as Hyperledger, Ethereum, and Ripple. Collaborate well with a small development team of highly engaged team members. Work with individuals across a variety of business teams and processes. Quickly learn how to design and implement optimized blockchain applications. Develop Smart Contracts in Golang and integration functionality in node.js. Practice Test Driven Development to rapidly deploy relevant functionality. Demonstrated experience in problem-solving and stakeholder communication. Salary: $68k – $106k Annually. Accenture is a global management consulting and professional services firm that provides strategy, consulting, digital, technology and operations services. They also happen to have the most Blockchain job openings in the world according to Forbes. The main roles that they are hiring for are the software developer, technical architect, and business strategist. But that still doesn’t explain why they need to utilize the blockchain. Turns out that it is about trust. As David Treat, managing director and co-head of Accenture’s global blockchain practice puts it, historically, organizations have rarely trusted one company to become a central data repository, “either because of the proprietary value of their data or due to a lack of trust in others.” With blockchains, multiple parties maintain a replica of recorded transactions that can’t be changed. Let’s look at the two top positions that Microsoft wishes to fulfill. Salary: $91k – $131k annually. The Systems Integrator team (SI) in Microsoft’s One Commercial Partner (OCP) organization, is seeking a senior business development manager to manage its recruiting and execution activities with top Global System Integrator (GSI), Advisory, and niche Blockchain partners, in addition to defining the through SI partner strategy for sales into Enterprise accounts. Proven competency to collaborate across organizations, deal with ambiguity and drive impact without direct authority. Visa Inc. is an American multinational financial services corporation headquartered in Foster City, California, United States. They are actively seeking blockchain experts to add to their team. It is hoped that using the blockchain system will clean up international banking. Must have hands-on experience with all aspects of software development: data, server side, UI, and open source software. Total Industry experience must be 6-8 years. Lead several unique Blockchain initiatives. We have seen a list of legacy companies who are offering blockchain jobs, but now let’s look at some of the crypto companies. Fortunately, there is no shortage of crypto job postings. 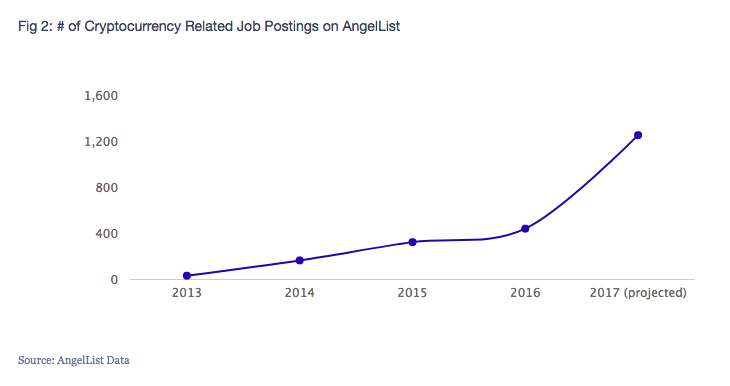 In fact, according to Angel.co, the number of listings by crypto companies have nearly doubled in 6 months. What is the kind of talent that these companies are looking for? Let’s start off with one of the biggest exchanges in the world, Coinbase. Let’s check some roles and jobs that they have available. Reporting and Monitoring: Design, create and automate reports and dashboards to track key business metrics for executive team and board. End-to-end Deep Dive Analytics: Deep dive into an area, find insights and understand the root cause of an observed trend, and translate the insights into actionable recommendations. Experience with Looker, Tableau or other visualization tools. Participate in growing the Corporate Development function by recruiting and developing new team members. 2+ years experience at top-tier company in corporate development, management consulting, or private equity. Strong analytical, problem solving, and communication skills. Let’s see the jobs they have available. The planner will present and propose ideas and recommend appropriate vendors based on M&E needs and budget. Research facilities and vendors, including convention centers, hotels, restaurants, audiovisual companies as requested. Draft and distribute RFPs as needed. Make recommendations based on M&E needs and budget. Select appropriate vendors for each meeting and negotiate contracts for convention centers, hotels, restaurants, ground transportation and audiovisual. Build and maintain good working relationships with meeting suppliers: hotels, restaurants, audiovisual and other meeting-related vendors. Arrange for temporary personnel at assigned meetings when necessary. Instruct them as to their duties and supervise their performance. Verify the accuracy of all meeting-related invoices and forward to VP for review. Responsible for monthly accruals and re-accruals for each assigned project. Assist VP in the preparation of budget expenses for the new fiscal year budget as it relates to expenses for all pertinent site costs. Keeps abreast of new industry trends. Attend industry events and meetings on behalf of CoinDesk. Analysis and deep reporting for news pieces published on our website. Attending and reporting at events, conferences and other industry meetings. Building relationships with and interviewing relevant influencers and companies. Editing articles and research reports. Sourcing news stories from the international blockchain community. Supporting 24-hour coverage of the bitcoin and blockchain industry. Deep knowledge of platforms: past experience producing content for the web (blogging, SlideShare, Facebook, Twitter). Experience: 2-3 years as a journalist or professional writer, preferably with end-market experience in the technology and/or finance sectors, proficiency with bitcoin, blockchain technology, and distributed ledgers, and previous employment in online/digital media. Flexibility and curiosity: We have a lean, mean team that often needs to work collaboratively to accomplish greater goals. Willingness to work in a fast-moving environment. So, there you have it. This guide should give you a good place to start if you are trying to get into this space! We wish you all the best in your venturesBlockchain Jobs: Is One Right for You?